Dual capsule. Dermatologically tested.A non-biological product does not contains enzymes. Many people have found the Persil Non-Biological formulations particularly suitable for their skin. How to get great results: Use 1 capsule for standard soiling and soft/medium water (3-5kg). Use 2 capsules for heavy soiling, hard water or a washing machine from 6-8kg. If ever your capsule leaves a little residue on your clothes, simply rinse under warm water. Do not use a pre-wash. Do not overload machine. This product contains a bittering agent on its surface to help prevent accidental ingestion by children. Wash hands after handling capsule. 1 Pop a single capsule in the back of the drum 2 Add laundry 3 Enjoy the great results! 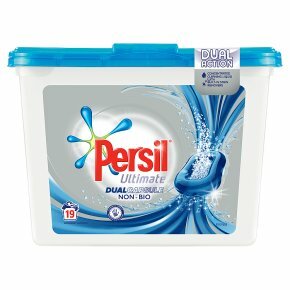 PERSIL NON-BIO<br>NON-BIOLOGICAL DETERGENT CAPSULES<br><br>WARNING<br><br>Causes serious eye irritation.<br>Causes skin irritation.<br>Harmful to aquatic life with long lasting effects.<br>Keep out of reach of children. IF ON SKIN: Wash with plenty of water. If skin irritation occurs: Get medical advice/attention.<br>IF IN EYES: Rinse cautiously with water for several minutes.<br>Remove contact lenses, if present and easy to do.<br>Continue rinsing. If eye irritation persists: Get medical advice/attention. Avoid release to the environment. Dispose of contents/container in accordance to national regulations.